An explosion and fire at this plant had a ripple effect on production lines throughout the automotive sector. The fire happened in the small city of Eaton Rapids, Michigan. But some major automakers around the country got burned. In the aftermath, any company would do well to assess its own risk management strategies – and the many mishaps and disasters that could mess up its supply chain. Eaton Rapids, just south of Lansing, is home to Meridian Magnesium Products of America. It’s a key supplier of lighter-weight magnesium parts that help automakers meet increasingly tough mileage standards. So, when a massive fire damaged the Meridian plant on May 2, a sudden shortage of magnesium parts affected suppliers and manufacturers from the Detroit area to the Deep South and beyond. Ford Motor Co. halted production of its F-150 pickups in Dearborn, Michigan, and Kansas City, Missouri, and suspended production of the F-Series Super Duty pickup at Louisville, Kentucky. Some shifts were canceled at the Mercedes-Benz U.S. International Plant in Vance, Alabama. GM halted production of full-size vans at its plant in Wentzville, Missouri. 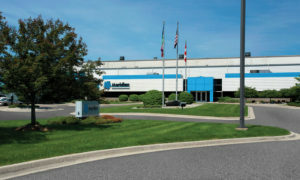 Interruptions also were reported at BMW’s SUV plant near Spartanburg, South Carolina, and at Fiat Chrysler’s Pacifica minivan plant in Windsor, Ontario, Canada. “Manufacturers take supply chains for granted until there is a disruption,” says Sree Rajagopalan, CEO of Murano Corporation, headquartered at Research Triangle Park in Durham, North Carolina. Murano works with manufacturers and distributors to help them reduce risks from such calamities. It uses a cloud-based system, Supply Chain Manager, to predict and plan for disruptions, using supply chain artificial intelligence (AI). The Murano CEO believes use of AI and cloud-based data analysis can help companies avoid the tunnel vision that limits knowledge about supply chain partners. Too often, he says, companies use systems that do not exchange information with external partners. That’s risky in an era of complex supply chains with vulnerabilities upstream and downstream. According to a 2016 survey by the Travelers insurance company, 31 percent of companies have a primary supplier located in an area prone to risky weather, natural disasters or political conflict. Almost half get at least 25 percent of their materials from a single supplier. Using cloud technology “breaks down the information islands, facilitates better collaboration between supply chain partners, leverages big data and incorporates predictive intelligence into the planning process,” Rajagopalan says. Better data enables better planning and better decisions. Sounds good, but could cloud technology and AI analysis prevent the scramble for alternate suppliers after an event like the Meridian fire? Rajagopalan thinks so. He cited some news reports that emerged after the fire. For example, the Lansing State Journal quoted nearby residents saying smaller fires broke out frequently at the Eaton Rapids plant. The Detroit Free Press reported that the plant had a history of citations, violations and fines related to employee safety. Cloud-based software can analyze big data and provide more complete information about factors like safety records, along with predictions about whether supply chain disruptions might be likely in the future, he says. “Businesses can make better decisions with more timely, relevant, accurate and critical supply chain data,” he says. Robert P. Hartwig, a risk management expert at the University of South Carolina says it’s important for companies to not only spot potential weak links in their supply chains, but predict the worst-case scenarios. “It’s unrealistic to expect that all of your suppliers are going to have pristine safety records, when we’re talking about the auto industry,” says Hartwig, a clinical associate professor and director of the university’s Center for Risk and Uncertainty Management. The trick is to gauge whether a potential problem is likely to cause a serious disruption, he says. “Risk management is a multi-stage process, and increasingly, it’s a field that’s more technology-driven,” Hartwig says. While technology can suggest supply chain solutions, it also can pose problems, Hartwig notes. Automotive industry supply chains reach beyond state lines and across oceans. Depending on its target, a cyberattack could keep planes on the ground, hinder efforts to track ships, cause massive power outages – even disrupt transportation so that employees can’t get to work. “Many companies operate with very thin inventories, and they have global supply chains that are potentially fragile,” Hartwig says. Lack of diversification magnifies the risks, he says, citing Toyota’s experience after the catastrophic 2011 earthquake, tsunami and nuclear plant damage in Japan in 2011. Though Toyota manufactures around the world, so many Japanese-made components were affected that shortages plagued the company for months. But it doesn’t take a magnitude 9 earthquake to cripple operations, says Rajagopalan, whose company works with Tier 1 suppliers to Mercedes and Honda. Supply chain analytics aim to do more than just connect the dots between vendors’ track records and their possible risks. Rajagopalan says three other key areas for analysis are avoiding excess inventory, spotting and correcting invoicing errors, and identifying supplier quality issues due to defective parts. “These three wasteful activities can lead to a ‘death by a thousand cuts’ situation,” posing longer-term, financial disruptions, he says. It’s hurricane season. Many automotive manufacturers and suppliers in the South are potentially in a hurricane’s path. Rajagopalan offers some advice – in addition to the need for emergency generators, of course. If possible, companies should aim to locate alternatives to single-sourced raw materials and manufacturers and suppliers should prioritize effective on-site drainage and ways to handle excess rainfall. Hartwig adds a cautionary note about another kind of calamity that can affect supply chains. “While a lot of focus might be on fires or natural disasters that impact manufacturing capabilities, there is another storm brewing: trade wars looming with virtually all U.S. trade partners,” he says. Any supply chain that extends overseas could be imperiled by trade disputes, Hartwig says. “The best risk management in the world could still leave companies vulnerable to the uncertainties of politics,” he says.